In Munich, we'll be staying for 3 nights at Le Meridien Hotel. 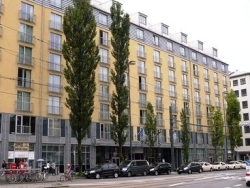 This luxurious, contemporary property is ideally located in the very center of Munich, across from the main train station and close to the shopping streets of Munich's Old Town, the famous Frauenkirche Cathedral, the Glockenspiel, Marienplatz Square, and St. Peter's Church. The hotel provides a 24-hour front desk service and currency exchange facility as well as a gift shop, newsstand, indoor swimming pool, sauna, steam room, and a full-service health spa. Additional services include concierge desk, dry cleaning, laundry service, and business center. The hotel has several dining options: Le Potager cafe offering French cuisine, La Table Gourmande with European and Asian fare, and La Traction Bar. Each of the hotel's 381 rooms is equipped with a/c, 2 telephones, flat screen TV, high-speed Internet, desk, blackout curtains, minibar, safe, and bathroom with a hair dryer, bathrobes, makeup mirror and designer toiletries. In Rothenburg, we'll be staying for 3 nights at the Hotel Romantik Markusturm. 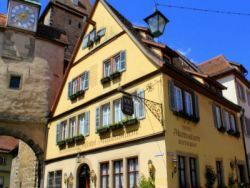 This historic and charming hotel was built in 1264 and is located at the Markusturm tower in the heart of the cobble-stoned streets of medieval Rothenburg, near the bustling and picturesque Marktplatz market square. The hotel features a traditional on-site restaurant with locally-sourced, seasonal specialties such as wine soup and home-brewed beer, and it serves a rich breakfast buffet daily. There is free Wi-Fi Internet throughout the hotel, as well as laundry service, currency exchange, dry-cleaning, luggage storage, and room service. The 25 smoke-free guestrooms are all furnished in an individual and unique style, many with antique furniture, and come equipped with a flat-screen satellite TV, sofa, writing desk, phone, and private bathroom with shower, hair-dryer, cosmetic mirror and upscale toiletries.